The red areas are shadowed parts of Mercury's polar region, as indicated by MESSENGER data. NASA's MESSENGER spacecraft has found new evidence of water ice near Mercury's shadowed polar craters, a finding that scientists say supports the hypothesis that the planet contains lots of water and frozen materials. Even though Mercury is the closest planet to the sun, it has pockets near its poles that are never touched by sunlight and could be cold enough for ice to remain unmelted, NASA explained. "For more than 20 years, the jury has been deliberating whether the planet closest to the sun hosts abundant water ice in its permanently shadowed polar regions," said Sean Solomon, principal investigator for the project, in a press release last week. "MESSENGER now has supplied a unanimous affirmative verdict." NASA's MESSENGER spacecraft - short for MErcury Surface, Space ENvironment, GEochemistry, and Ranging - has been observing Mercury since it was launched in March 2011, and the images it has captured so far confirm the water ice hypothesis. "The new observations from MESSENGER support the idea that ice is the major constituent of Mercury's north polar deposits," NASA said. 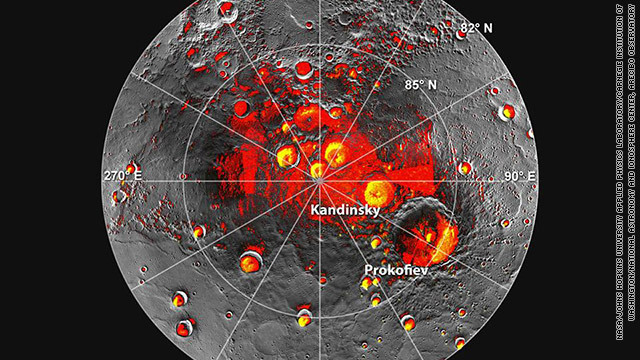 The spacecraft measured neutrons and excess hydrogen from Mercury's north pole region. NASA has opened its arms to the public by asking scientists to submit detailed concepts on how it can make good use of two huge telescopes that it received from the United States Spy Satellite Agency earlier this year. “Because there are two telescopes, there is room for projects that span the gamut of the imagination,” Michael Moore, a senior program executive, said in a statement last week. The two instruments are similar to NASA’s Hubble Space Telescope in size and appearance but have a wider field of view. “They already are being studied for possible use as a wide field infrared survey observatory,” the statement added. NASA will select the best concepts for further assessment as it moves forward with its plans to invest in science and technology. In early February 2013, the people with the most intriguing suggestions will present their ideas at a workshop in Huntsville, Alabama. A group of NASA researchers, including nuclear engineers from Los Alamos National Laboratory, has demonstrated a new way to generate reliable electric power for space missions. “A small, simple, lightweight fission power system could lead to a new and enhanced capability for space science and exploration," Patrick McClure, a Los Alamos project lead, said in a news release last week. The team used a heat pipe to cool a small nuclear reactor and a Stirling engine to convert the reactor’s heat into electricity during an experiment known as Demonstration Using Flattop Fissions, or DUFF - the first demonstration in the United States since 1965 of a space nuclear reactor system to generate electricity. The power supplies on current spacecraft are modest, and the new system could increase what they can do, and how fast. “The availability of more power could potentially boost the speed with which mission data is transmitted back to earth or increase the number of instruments that could be operated at the same time aboard a spacecraft,” according to the statement. Astronomers discovered baby planets in the process of being born around UX Tauri A, a million-year-old star that lies about 450 light-years from Earth, Space.com reports. Scientists used the Subaru Telescope in Hawaii to capture images of large, nonspherical dust particles sticking to each other around the distant star, snapshots that led researchers to believe that planet formation was taking place. NASA’s Spitzer Space Telescope found evidence of planet formation in 2007 when it observed a gap in a dusty disk surrounding UX Tauri A, Space.com said. Astronomers have discovered a quasar with a remarkable outflow that is at least five times more powerful than what scientists have seen in the past, a revelation that is crucial in explaining the evolution of galaxies and may help explain why there are few huge galaxies in the universe. Quasars are the bright centers of galaxies, powered by giant black holes. “This is about 100 times higher than the total power output of the Milky Way galaxy. It is a monster of an outflow,” Nahum Arav, the study’s team leader, said in a statement last week. Scientists from the European Southern Observatory used a large telescope located at the Paranal Observatory in Chile to study the quasar. “This is the first time that a quasar outflow has been measured to have the sort of very high energies that are predicted by theory,” Arav added. The newly discovered outflow lies about 1,000 light-years from the super massive black hole which is at the center of a quasar SDSS J1106-1939. “I’ve been looking for something like this for a decade so it’s thrilling to find one of the monster outflows that have been predicted,” Arav added. Scientist have witnessed a gigantic black hole in a tiny galaxy known as NGC 1277, about 220 million light-years from the Milky Way, a discovery that upsets the idea that only massive galaxies have super massive black holes. “The surprise finding is hard to reconcile with existing models of black hole growth, which hold that they evolve in tandem with host galaxies,” BBC News reports. The huge black hole is 4,000 times bigger than the one located in the middle of our Milky Way galaxy, and it’s as big as our solar system. “We are trying to figure out how this happens, and we don’t have an answer for that yet. But that’s why it’s cool,” Remco Van den Bosch of the Max Planck Institute explained to BBC News. You are in reality a good webmaster. The website loading speed is incredible. It seems that you are doing any distinctive trick. Furthermore, The contents are masterwork. you have done a great activity in this topic!